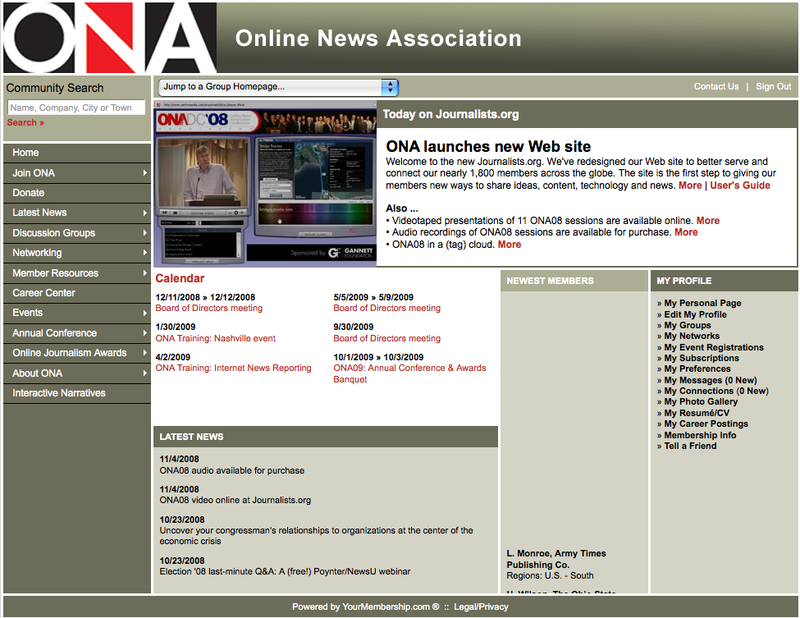 The Online News Association officially launched their new Web site (see right) Monday evening. If you’re a member with full access, or even a non-member just perusing, you can tell this site is big step forward. Networking features, including discussion groups that connect members by region and area of interest, giving you the ability to have one-on-one conversations and to chat in real time. An easy-to-navigate membership directory â€“ searchable by name, type of organization, areas of expertise, and more â€“ enabling you to more easily network with people with common interests. A Career Center that allows members to post and search job openings. A new training section with innovative digital presentations tagged by topic, source and medium. This section features videotaped sessions from ONAâ€™s sold-out 2008 annual conference, with tips on the latest techniques in multimedia storytelling from the New York Times, Washington Post, USA TODAY and the BBC, among others. If you’re a student ONA member, please join us! 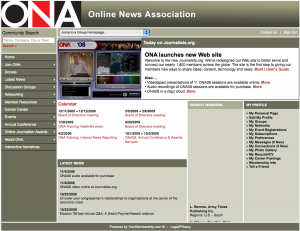 If you’re a student interested in online journalism, I highly recommend joining ONA.Â I joined in April and think ONA is a group often overlooked by student journalists (read about membership benefits). For only $25 a year, you can’t say no. One benefit is that you get a heavily discounted conference registration — we’re talking less than half the pro rate. And if you saw my posts or tweets about this year’s gathering in D.C., you’d see why the experience is so valuable. I went to a number of great sessions, but more important are the connections you make. As someone in the midst of an internship – and soon job – search, I can’t emphasize that enough.